Saticoy Country Club Hole 1: A decision faces the golfer on the first shot of the day, setting the precedent for a course that will really make the player think to score well. From an elevated tee with OB left, the fairway starts wide and narrows significantly at about 150 yards from the green. This green is surrounded by 3 bunkers and will provide the first of many tricky putts that are difficult to read. So, the longer drive will leave a shorter shot to this well-guarded green, but runs the risk of missing the tiny fairway and having the approach blocked by one of many trees. Saticoy Country Club Hole 2: The second hole is a short, but unbelievably great dogleg left par four. 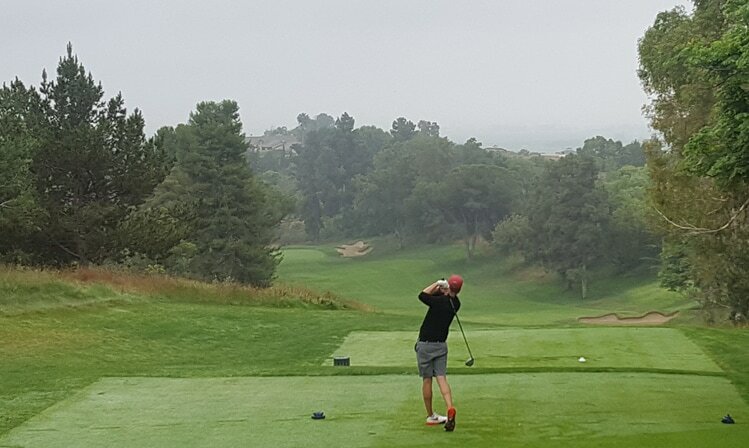 The golfer is strongly encouraged to hit a shot between 170-200 yards through a shoot of trees, avoiding going left at all costs as any approach shot will be blocked by a Mammoth tree on the left side of the fairway. Of course going right too far equals OB or a side hill or sand trap shot at best. The ideal drive is either right center, or hit far enough to catch the slope of the shelved fairway, leaving a wedge to the green. This green is surrounded by bunkers, slopes heavily from back to front and is terribly narrow. Any miss is bad for the golfer, but those to the left or long will leave a downhill chip or bunker shot running away from the player, rendering an up and down nearly impossible. Saticoy Country Club Hole 3: A tough test awaits the golfer on this uphill par 4 that plays much longer than its length. The drive must be shaped correctly to avoid overhanging trees left and right of the fairway. The second shot must avoid the cavernous bunker front right and stay below the hole. Any downhill or side hill putt is almost unmanageable. 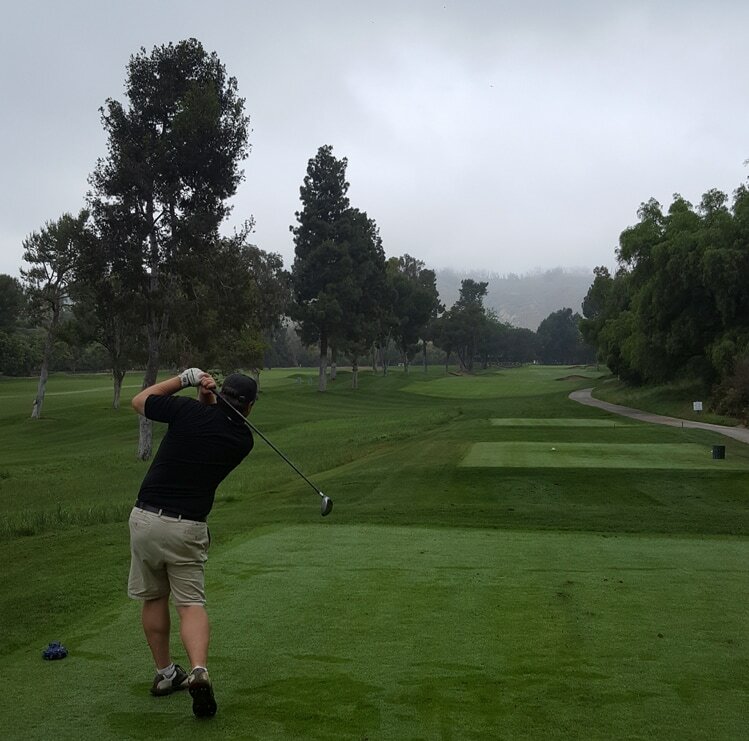 Saticoy Country Club Hole 4: This one shotter is more difficult than it appears from the tee. The trouble (3 large bunkers and large trees right) appears obvious, but it is the overcompensated pull left that will spell disaster for the unwary golfer as any shot hit left or long will careen down the hill leaving a chip to the deceptive green where no putt seems to break the same way twice. Saticoy Country Club Hole 5: A good dogleg left par 4 with a relatively wide fairway, for Saticoy. However, the golfer must avoid spraying too much as lots of trees are waiting to keep the golfer from reaching in regulation. The approach is slightly uphill with bunkers surrounding the green, again. A huge tier separates the back of the green from the rest of the dance floor, but affects most pin placements. 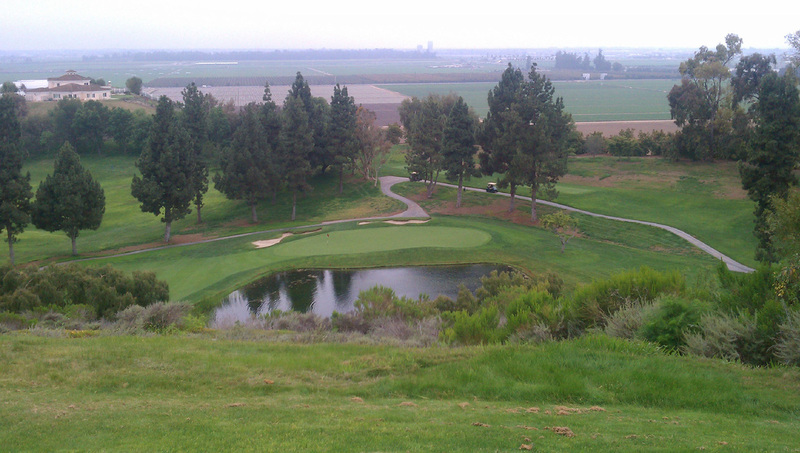 Saticoy Country Club Hole 6 (left): The first “birdie” hole is a short par 5 dogleg left. However, OB runs down the left side of the hole from tee to green and an unkempt hillside will swallow the pushed shots. The key to this hole is the second, which must avoid a large pine tree left that will block the view to the green. However, the better approach to the green is from the right side, so precision is required. A huge bunker front left and another to the right guard the green. The green slopes severely and any pin tucked back left is scary tough. Saticoy Country Club Hole 9: An uphill par 3 with palm trees and a lake right. Three bunkers will trap the less than precise shot and the right pin placement is sandwiched between two of them, right next to the water. Oh yeah, the green, again, leaves nasty puts from just about anywhere. Saticoy Country Club Hole 10: Short, and way downhill over a lake, with two bunkers in the back, this 3 par isn’t difficult with no wind, but the nerves may not feel the same way and the view of the Pacific Ocean and Channel Islands can be a distraction as well. Any front right pin placement provides slippery putts. The real challenge here is gauging the slope and the inevitable afternoon wind in the golfer’s face. 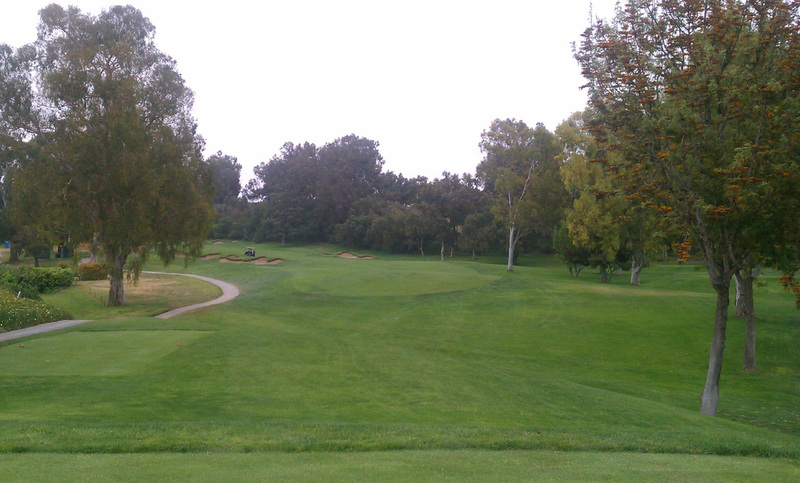 Saticoy Country Club Hole 11 (above): A very difficult par 4 with a fairway that slopes from left to right all the way. Large trees, without a doubt, will block any misplayed drive. The uphill second is deceiving as the green is farther away than it appears, and is very skinny and deep. Anything hit left or right will catch a bunker or be shot down a hill, leaving a tricky shot that will break a ton toward the front of the green. Staying below the hole is very helpful. Saticoy Country Club Hole 12 (left): A neat par 4 with a clear choice presented on the tee: thread the drive into the tiny slot between the overhanging trees, or fly the right tree, flirting with the hillside and OB right. Any successful shot will leave a short iron, straight uphill to a green with 3 bunkers surrounding. Saticoy Country Club Hole 13: A long and difficult par 3 with four bunkers surrounding the green. Any miss hit shot not finding a bunker will be on a hillside with a difficult chip to a tough green to putt, as usual. Saticoy Country Club Hole 14: A dog leg left par 5 that runs along a canyon. Reaching in two is only possible with two perfect shot that fly at least a portion of the canyon’s corners, but reaching in 3 is difficult enough. If the canyon can be avoided, the approach must find the right 3rd of the green in order to have a chance as the green has a nasty back to front slope and bunkers right, left and behind. When the pin is cut back, getting close is near impossible. Saticoy Country Club Hole 15: A picturesque downhill dog leg right par 4 with a very tight drive between trees. This drive cannot go to far left as it will be blocked by a mammoth tree and anything right will be blocked by many more. The green is relatively accessible for Saticoy and is flat as well. Saticoy Country Club Hole 16: A golf hole that resembles the 12th as it is short and an uphill dog leg right. An aggressive play can carry the fairway bunker right, leaving a pitch to the green, but if it is pushed too far right, reaching the green is near impossible as the trees are scary thick and the bunker right of the green is unavoidable. For the short iron tee shot to the wide fairway will leave a blind approach to the most diabolical green on the course. Any putt from any length will break a lot, or be quite uphill or downhill. A truly great risk / reward hole faces the golfer at the sixteenth. Saticoy Country Club Hole 17: The toughest hole on the golf course is 470 yards. The only help is that the drive is way downhill. This isn’t much comfort as any shot pushed right will be on a bunker or a steep hillside and anything left will be OB or blocked by trees. The approach to the green is tight with a deep-faced bunker front left and a large overhanging tree and bunker right. However, the green is one of the easiest to putt on the course. It’s getting there that is the problem. Saticoy Country Club Hole 18: The finishing hole is a 3-shotter for most everyone with a wide fairway for the last tee shot of the day. The second shot must be played well as anything to far right will be blocked by a large tree and anything too far left will leave a much more difficult approach to the uphill green which at the end of the dog leg right. There are two bunkers on each side of the green and a lake long. Good finishing hole on a great course. 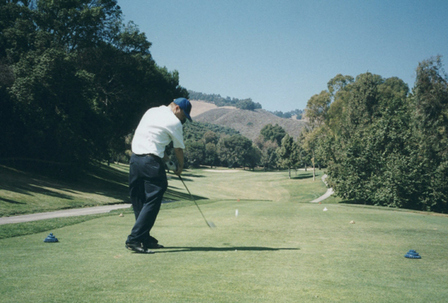 Read More Ventura Golf Course Reviews. other Top Golf Reviews in Ventura.